Designed to excel, InnJoo 3 is all set to dazzle customers across Middle East Africa with MediaTek Chipset inside. Dubai, UAE: InnJoo, the fastest growing smartphone brand in Middle East today announced that it has joined hands with MediaTek to launch its flagship smartphone, InnJoo 3 at GITEX Technology Week. Commented on the new launch, Rami Osman, Director MEA of MediaTek said, “InnJoo has been steadily growing in the emerging markets of Middle East and Africa with product propositions well matched to the aspirations of buyers who want to upgrade to a reliable Smartphone. This device (InnJoo 3) will run on our MediaTek MT6750T – a powerful LTE Cat-6 processor and communication chipset – and bring its high value to excellent price points. Users will have data throughput capability up to 300Mbps by implementing LTE Carrier Aggregation (Operator dependent), it will also allow for faster charging times (with built in Adapter) and better quality of the image display – all by using MediaTek technologies. The 5.5-inch Full HD IPS display screen smartphone is powered by MediaTek LTE Cat-6 MT6750T, the Octa-core processor clocked at 1.5GHz and Mali-T860MP2 GPU and runs on Android 6.0, and. The device comes with 4GB RAM and packs 64GB inbuilt storage with a flexibility to expand storage up to 128GB via micro SD card. 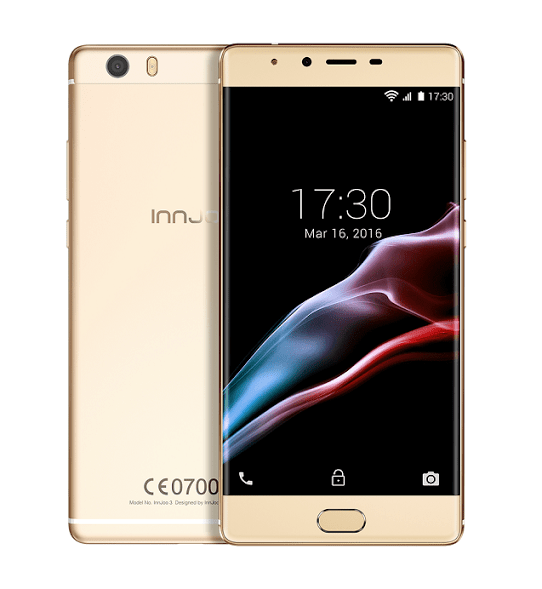 Also the first time InnJoo have designed its physical fingerprint button in front other than its previous back design, and a beautifully crafted metal body delivers a premium and elegant appearance. The 4G LTE InnJoo 3 smartphone features Dragontrail glass that safeguards the 5 points touch screen from scratches and damages. The smartphone sports a 21-megapixel rear autofocus camera with flash and f/1.8 aperture, whereas, the 8-megapixel front camera – supported by Sony IMX219 image sensor -allows picture perfect selfies. The device is backed by a powerful 3000mAh battery to last longer. RapidCharge technology enables two-hours talk time by only a 5mins charge with type-C USB. The premium looking phone is available in Gold, Grey, Black and Blue shades.